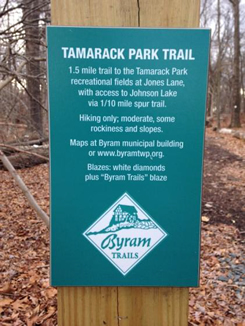 Tamarack Park Trail connects Byram Township's greenways, established trails, and community focal points. The trail extends from Route 206 at Tamarack Park to C. O. Johnson Park at Roseville Road. Terrain varies; a spur trail leads to Johnson Lake (seen from Tamarack Road, this spur looks like a paved driveway). Exit 25 off Route 80, take Route 206 North, about 5 miles to the traffic light at the intersection of Route 206 and Tamarack Road (Cranberry Deli is on the corner). Continue through the traffic light, about 1/4 of a mile. On the right, you will pass Jones Lane and the entrance to Tamarack Park is on the right. If you pass Panther Lake Campground Resort, you've gone too far. To reach the trailhead, walk around the fields to the back right portion of the field. Tamarack Park is a newly established park, with an anticipated opening of May, 2017. 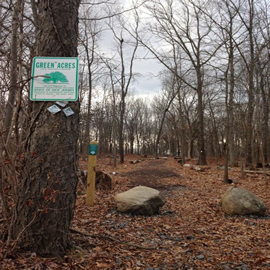 Until the park officially opens, hikers are welcome to hike this trail in reverse. Written directions provided above will guide visitors to the trailhead at the end of the trail. This is an easy-to-moderate hike. Much of the trail is relatively flat; the terrain varies in difficulty. The trail begins at Tamarack Park off Route 206 and starts with a steep incline along rock surfaces. This section is marked by large glacial erratics and runs up and down a rocky slope which flattens out along the ridge. As the trail gets closer to Johnson Lake, the terrain flattens out. The trail ends on a smooth downhill slope leading to C.O. Johnson Park. There are two main parking areas for this trail, with C.O. Johnson Park having the most parking. 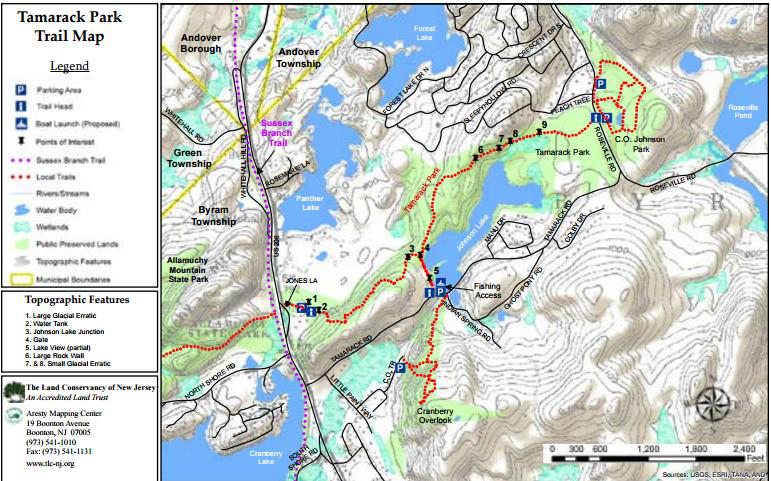 The Tamarack Park Trail connects to one spur of the Cranberry Overlook Trail, to other trails in Allamuchy Mountain State Park and to the Sussex Branch Trail, both located across Route 206 from Jones Lane. Parking Areas at located at Tamarack Park Field (in the gravel parking lot) and at C.O. Johnson Park (trailhead is on the left).